Chateau Morrisette is among the oldest and largest wineries in Virginia. We also operate an award-winning restaurant with a 95% recommendation rate on OpenTable. With fresh vintages, flavors, and events at the winery, restaurant, vineyard, and festival field throughout the year, we will keep you abreast of all the great happenings and the people who make up Chateau Morrisette Winery and Restaurant in this blog and through our Facebook, Instagram, Twitter, and Pinterest sites. Spend Valentine's Day with us! Stay for the Weekend! 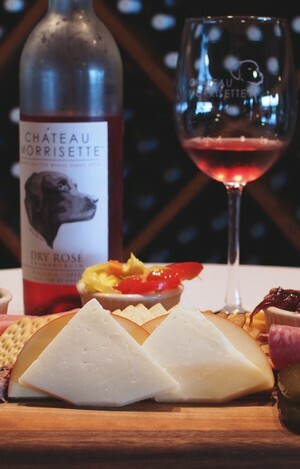 Chateau Morrisette has a full plate for you this Valentine's Day Weekend. Looking for a romatic restaurant to enjoy dinner? Chateau Morrisette is the place. Cozy fireside dining for Valentine's lunch or dinner. Our Puppy Love is a prix fixe menu, a Valentine's restaurant deal, with three courses of delicious food and a glass of our newly released Vin Gris. For those wanting to stay for Valentine's Weekend or who just want to continue their celebration, the Puppy Love menu is offered all weekend long. Plus, the very popular Wine & Chocolate is back again this year. 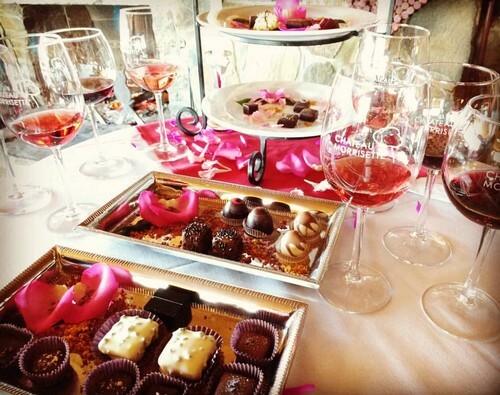 Join us for a titillating five course pairing of wine and chocolate. See below for all the details. Treat your sweet and kindle romance with crisp winter views of the Blue Ridge and a romantic dining experience prepared by our culinary team. 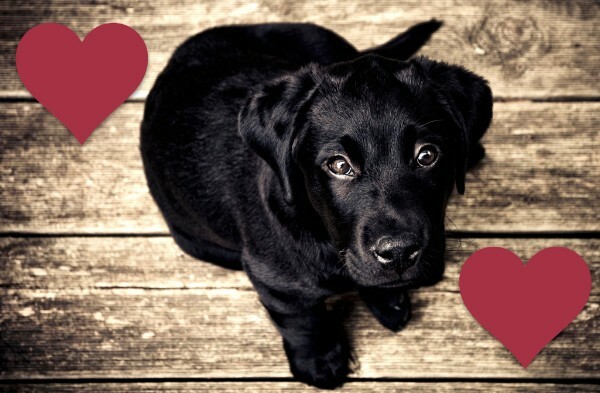 Valentine's Day, we will offer our special fixed price Puppy Love menu alongside our new winter menu from 11a-8p. Indulge in six courses of select Chateau Morrisette wines paired with chocolates handcrafted by local chocolatier Cocoa Mia. Two seatings Saturday, February 16: 1-3p and 5-7p. One seating Sunday, February 17: 2-4p. Tickets, $50 per person, include wines, chocolates, tax, and gratuity. Weekend Getaway: Visit our Lodging Partners page and find a beautiful mountain cabin, a relaxing B&B, or a hotel that's just right. Valentine's Day Weekend Getaways are here. 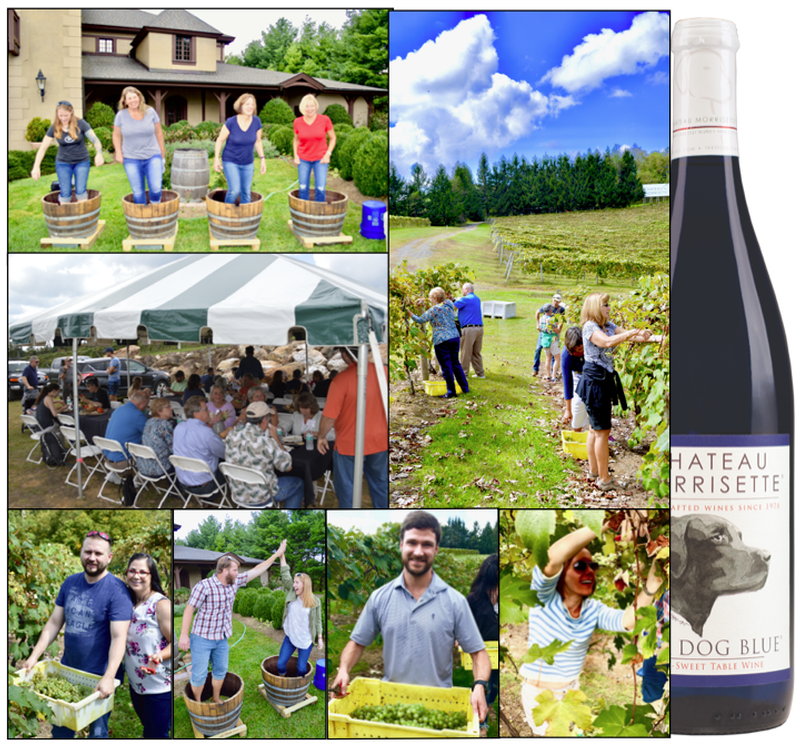 Chateau Morrisette is a third generation tradition in Virginia winemaking in the heart of the Blue Ridge Mountains. Just off milepost 171.5 of the Blue Ridge Parkway, we offer refined rustic dining and wine tastings and tours year round. We are working very hard to find the best solution for the opening of our tasting room in downtown Roanoke. We have run into delays and zoning issues with the city and do hope for a resolution soon. The current space leased may not work out for Chateau Morrisette but we will be opening a tasting room somewhere in downtown Roanoke. Our goal is to open a tasting room where we can provide the best service possible and give our guests the best experience possible. Roanoke has been great to us for 40 years and there is no other location choice for our first offsite tasting room! We will keep everyone posted and thank you for your support. The Blue Ridge Parkway is known as "America's Favorite Drive." It spans 469 miles, connecting Cherokee, North Carolina with Rock Fish Gap, Virginia. Each mile along the way is marked with a Mile Post (MP) number to help visitors find just what they are looking for as they meander through the Appalachian Highlands. Located just north of the Parkway's center, Chateau Morrisette can be found between MP 171 and 172 in beautiful Floyd County, Virginia. It's a must-stop when traveling along Virginia's Plateau. Guests enjoy fine dining in a casual setting as well as first class wines produced by one of Virginia's oldest and largest wineries. A visit to the Blue Ridge Parkway is phenomenal any time of year, but it is especially spectacular from early October through mid November when the deciduous trees are changing colors and dropping their leaves before winter takes hold. 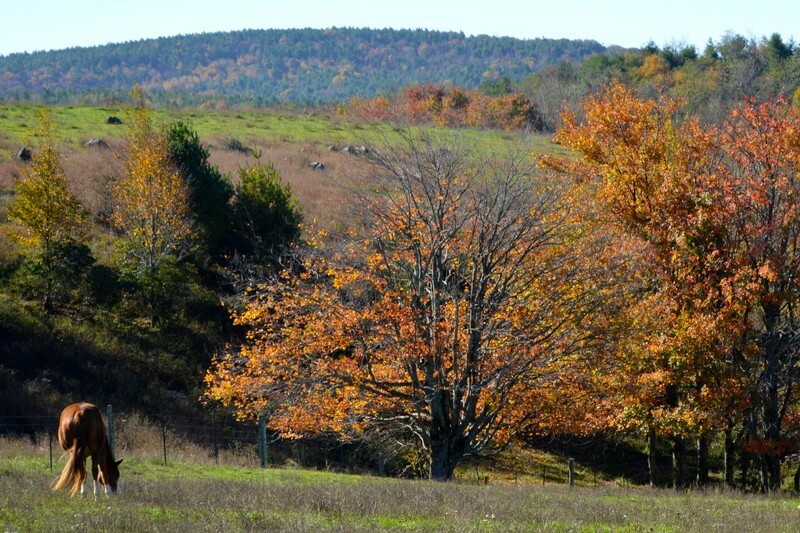 Leaves begin to change color at higher elevations in early October. The intensity of color is determined by many factors, including the amount of rainfall, the average temperature, and the amount of wind in a particular area. For areas above 3500 feet, the peak time is predicted to be around October 12-15, 2018. As the elevation decreases, the peak color change works it way down the mountains over time. Floyd County, home to Chateau Morrisette Winery and Restaurant, spans an elevation between 2000 and 4000 feet which means the ideal time to visit for fall color will be from October 12th through the end of the month. Again, this could change based on weather patterns in September. For the most up to date information, check out the Virginia Fall Foliage Report from the Virginia Department of Forestry. Click here for Fall Foliage Report. The Blue Ridge Parkway area around Chateau Morrisette is known as the Rocky Knob. 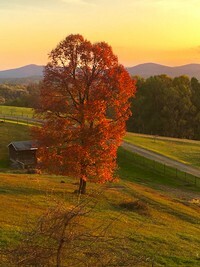 Throughout this region, visitors are treated to the changing colors of a variety of trees, including hickories, maples, oaks, tulip trees, locust, basswoods, and even a stand of big tooth aspens. Mountain laurel and goldenrod are also abundant all along the Parkway. In late September and early October, the stands of goldenrod turn bright yellow to announce the beginning of fall. Maple trees are next to turn showing bright red and orange leaves. The rest will follow shortly afterwards. 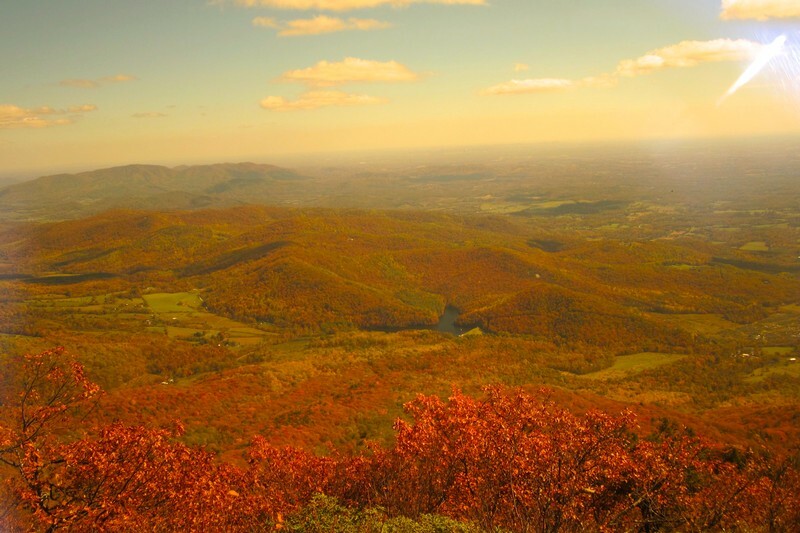 Another good source for up-to-date information about fall foliage is the Blue Ridge Mountain Life Fall Foliage Forecast and Guide on Blue Ridge Mountain Life. For up-to-date weather along the Blue Ridge Parkway, click here for the Blue Rige Parkway Weather website. 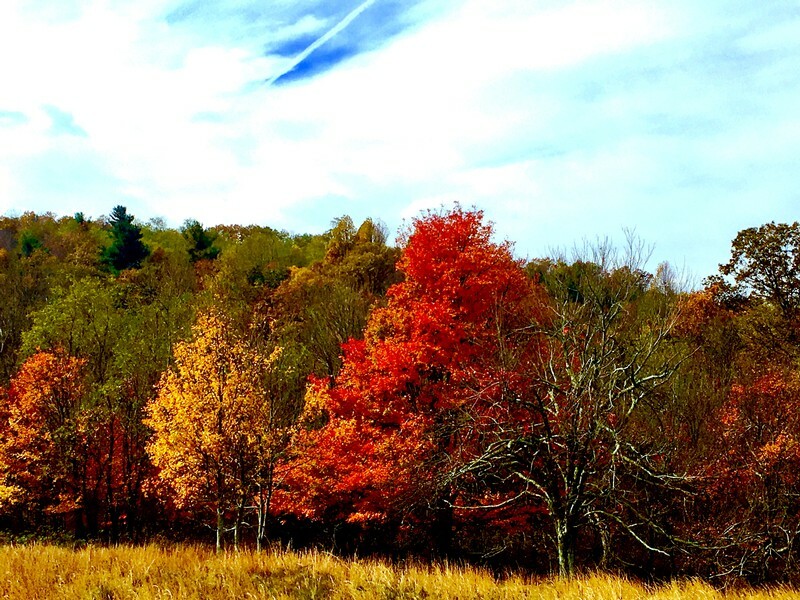 Driving the Blue Ridge Parkway is just one way visitors can take in the breathtaking colors of autumn. Floyd County, Virginia is home to about 40 miles of Blue Ridge Parkway along its southern border. Within the county, visitors will find many opportunities to stop the car and step into the fresh mountain air. 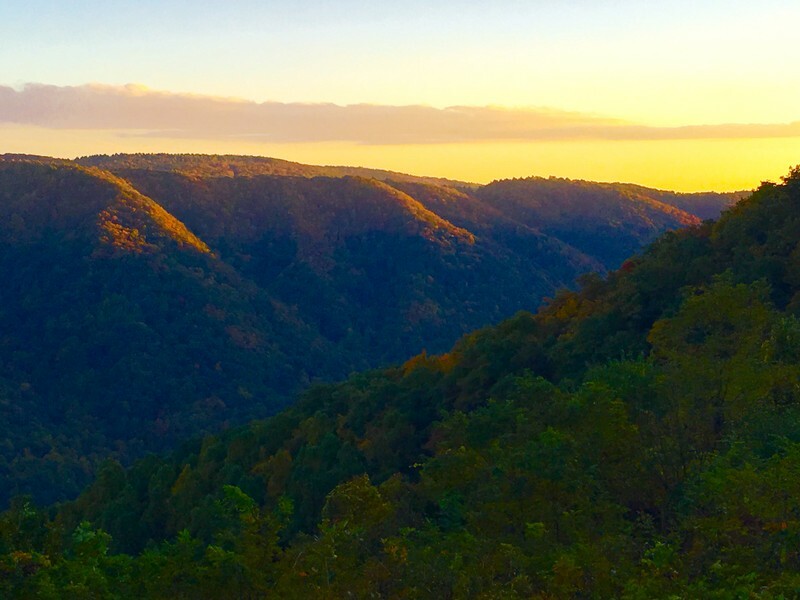 Along the stretch through Floyd County, there are numerous scenic overlooks, with two of the favorites being The Saddle Overlook (MP167.5) and the Rock Castle Gorge Overlook (MP 168). Additionally, the Rocky Knob and Smart View Recreation Areas along with Mabry Mill are all great places to stop, explore, and stretch your legs. For those feeling a bit more adventurous, there are a number of backroads just off the Blue Ridge Parkway. Most of these roads connect to other roads but don't be afraid, you can always retrace your path if you get lost. County maps are available at the Floyd Visitor Center. Exploring the scenic backroads allows visitors to discover those special places known only to locals and to experience fall color in all its rural splendor. Some roads are paved and some are gravel, but both promise an experience not to be forgotten. Pictured left is Emanuel Road, connecting Black Ridge (726) with Conners Grove (799). It's unpaved and pristine. Another unpaved treasure is Fairview Church Road, connecting Black Ridge Road (726) with Parkway Lane (SR 8). If paved roads are more to your liking, wind across Floyd County on Franklin Pike from the Blue Ridge Parkway to Route 221. Or take Route 8 South from the Parkway to Stuart and circle back up the mountain on US 58, where you will not want to miss Lover's Leap at the top of the mountain. For a good map of paved backroads of Floyd, Patrick, Franklin, and Carroll Counties, check out The Jagged Edge of Virginia. 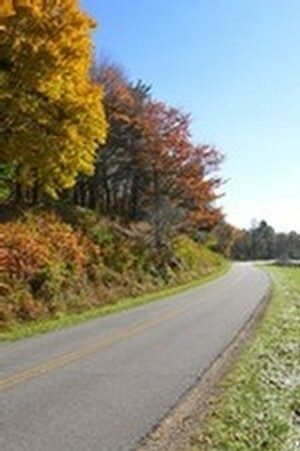 This site offers loop rides for cars and motorcycles that provide some of the most spectacular vistas of the entire region. Chateau Morrisette is a great starting point and ending point for any mountain adventure. It's located only 300 yards from the Parkway itself and is known as the most decadent overlook on the Parkway! Hiking and walking trails abound throughout the Blue Ridge Parkway National Park. From a simple quarter mile stroll around Mabry Mill to a strenuous 10.9 loop hike through the Rock Castle Gorge, there is a trail for everyone to enjoy. Hiking areas include the Rocky Knob Recreation Area with three trails that can also be mixed and matched for the desired distance. 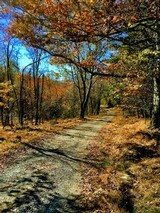 The Picnic Trail is an easy one mile loop starting at the Rocky Knob Visitors Center. For a little more distance, try The Black Ridge Trail at 3 miles, looping from the Rocky Knob Visitors Center. 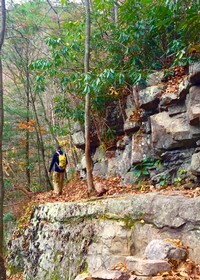 And for the dedicated hiker, the Rock Castle Gorge Trail is a 10.9 mile hike that offers long distance vistas, a boulder field, waterfalls and streams, and spectacular fall foliage from a variety of trees. Information about these hikes are available on the Blue Ridge Parkway app or on the National Park Service website. 14.5 miles north on the Blue Ridge Parkway in Floyd County, visitors will find the Smart View Recreation Area. This is a lovely place to picnic or to enjoy the 2.6 mile loop hike with its panoramic view of the Piedmont below. If you want to see Floyd County's highest peak, drive over to the Buffalo Mountain Nature Preserve. A short one mile hike up Buffalo Moutain gives visitors a vast overview of the entire region from 3,971 feet above sea level and an unsurpassed view of the ocean of fall color in the valley below. For something a little different, take a walk around Chateau Morrisette's estate. 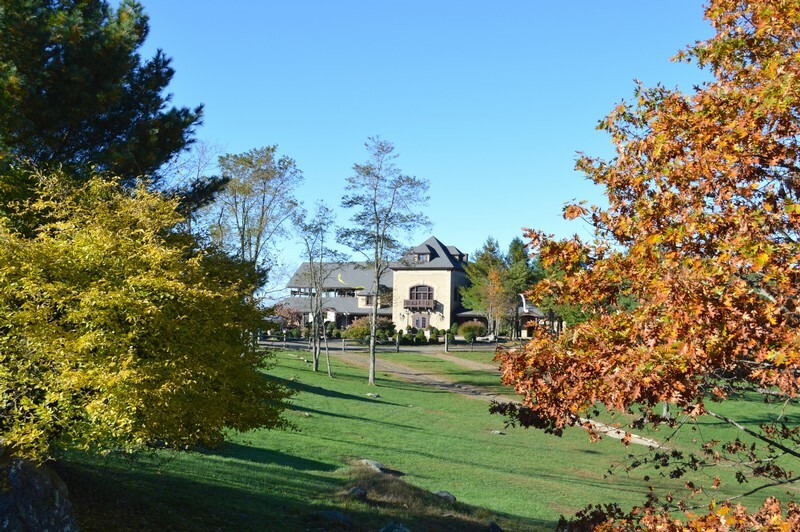 Sitting atop 38 acres, Chateau Morrisette's behind-the-scenes is waiting to be discovered. From almost anywhere on the estate, you will encounter scenic vistas unlike any other. The international restaurant dining platform Open Table named Chateau Morrisette as having one of the top 100 restaurant views in America. It's just that awesome! You might want to grab a bottle of wine and a couple of glasses and take a stroll with someone special down to the vineyard. It's about one-half mile along a shaded, gravel road (shown left). Once there, visitors discover over 13 acres of recently harvested grape vines, with views across the southwestern mountain slope. Find your spot among the vines and enjoy some wine away from all the others. It's a piece of heaven. Oh, and if you see a grape we left behind, it's all yours! And if biking is more aligned with your interest, there are plenty of opportunities for that as well. People come from all over the world to bike along the Blue Ridge Parkway. It's the perfect opportunity to take your time, climb at your own pace, and enjoy the beautiful colors of autumn. The downhill ride is a lot of fun too! Biking along the backroads is also a worthy venture. There are a number of routes waiting to be explored. Cycle Floyd has rides from 2.6 miles to 27 miles already mapped out to make autumn biking as simple and as beautiful as possible. You can pick up a printed map at the Floyd Visitor Center or download it from the Cycle Floyd website. Fall colors are not limited to the trees. If you have the time, don't miss an autumn sunrise or sunset from the Blue Ridge Parkway. The color of the sky is resplendent in deep oranges, reds, and purples. It's a photographer's dream come true. Find an open pasture with silhouetted livestock to take the perfect photograph. The morning and evening light makes the trees shimmer in rich colors, the grasses a faint autumn green, and the shadows long and sinuous. Perhaps you just want to sit back, relax, and take in the sunset. The Chateau Morrisette Restaurant has outdoor seating looking to the northwest and providing incredible views of the autumn sunsets. Open for dinner on Friday and Saturday evenings, Chateau Morrisette is the perfect location to enjoy some wine and a meal while watching the sun set over the mountains and valleys below. If the weather should be too cool to sit outside, then take a seat by the window and enjoy the warmth of the fireside dining rooms. In early October, the sun will set around 7pm with twilight lighting thirty minutes on either side of the sunset. By the end of the month, the sun will set around 6:25pm. 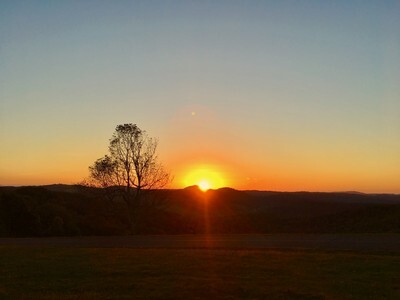 To check the times for sunrise and sunset in October, visit Sunrise-Sunset for times all along the Blue Ridge Parkway. During the month of October, thousands of visitors will travel the Blue Ridge Parkway to enjoy leaf peeping and all the fall foliage. Chateau Morrisette provides as oasis along the way where visitors can stop in, take a break, get something to eat, use the rest room, tour the wine cellar, and enjoy some wine while taking in our fifty mile view across the valley. Both the winery and the restaurant are open every day of the month. The Restaurant serves lunch from 11-2 Monday through Thursday, 11-4 Friday and Saturday, and brunch from 11-3 on Sunday. Dinner is offered Friday and Saturday from 5PM until 9PM. The Winery is open for tours, tastings, and shopping Monday through Thursday from 10AM-5PM, Friday and Saturday from 10AM-6PM, and Sunday from 11AM-5PM. 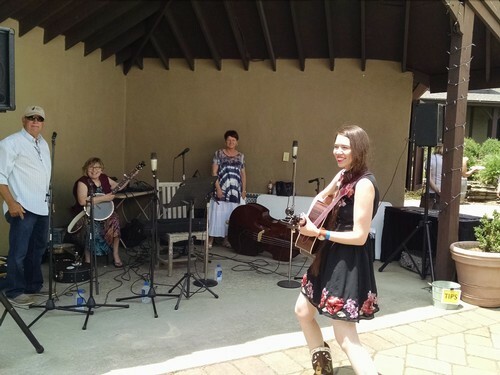 Live music and a light food service is offered every Sunday on the Winery Courtyard. Chateau Morrisette is pet friendly. Restaurant Menus change seasonally. Take a look at all of our menus, lunch, dinner, brunch, dessert, even the current wine list! Restaurant Hours also change seasonally. June through October is prime season along the Blue Ridge Parkway. Reservations are important to make sure you're not waiting too long for a seat. While not required, they are strongly recommended. You may also make reservations by calling +1-540-593-2865. Sunday Sounds is our live music offering every Sunday. Enjoy a variety of genres from jazz to blues to folk and Appalachian Roots music. Nearby Attractions abound. Historic sites, outdoor recreation, and other wineries just to name a few. 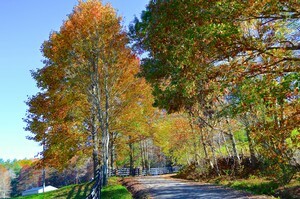 Lodging accommodations are varied and in high demand during fall foliage season along the Blue Ridge Parkway. Book early. Directions to find Chateau Morrisette Winery and Restaurant. Enjoy your visit to the Blue Ridge Parkway of Virginia and we hope you will include Chateau Morrisette while you're here. 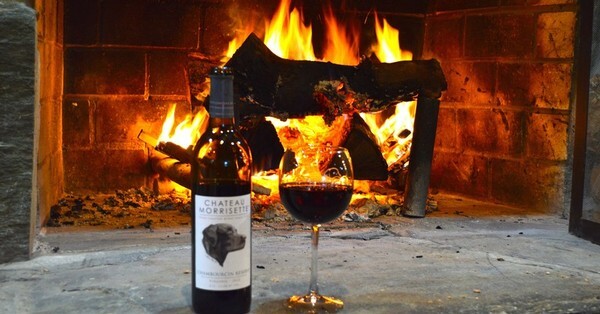 Harvest with the Dogs is a one of a kind vineyard experience hosted by Chateau Morrisette Winery. Spend an afternoon in the Blue Ridge Mountains of Virginia learning to harvest and process grapes. You'll have a lot of fun and some excellent food and wine while you learn. Your adventure begins with a wagon ride from the winery down to the Vineyard. Once there, you'll meet with our owner, David Morrisette and our Vineyard Manager, Steve VanSutphin. After a short orientation, you'll be given cutters and a lug and pointed in the direction of the vines to be harvested. Spend about a hour or less harvesting grapes with your own two hands. Once the grapes are cut, you'll travel by wagon back to the winery where you will meet with our Winemaker, Jason Crolley. Jason will teach you how to crush the grapes, process them, and make the wine. So while it may sound like hard work, you will have plenty of time to relax over lunch hosted in the vineyard, a glass or two of your favorite Chateau Morrisette wine, and even a tasting of a wine in process on your tour of the cellar with Jason. Once complete, you'll have an opportunity (if you want) to step back in time and experience the ancient way of processing grapes by climbing into a barrel and stomping them with your own two feet. Your adventure concludes with a complimentary wine tasting in our tasting room and a t-shirt of your choice. It will be a day to remember! 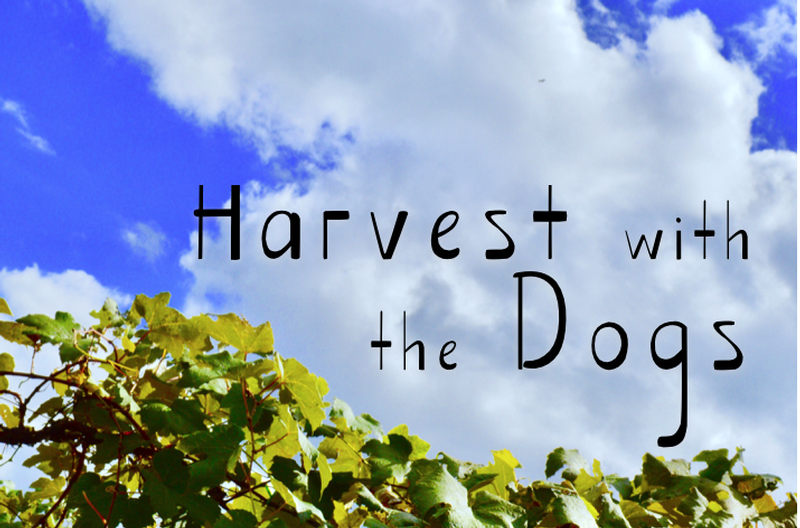 Harvest with the Dogs takes place on Saturday, September 15th at 10AM or 1PM and on Sunday, September 16th at 1PM. Participation is limited to 32 people per session. Tickets are $75 per person and include lunch, wine, wine tastings, tour, t-shirt, and your vineyard harvest experience. It happens rain or shine so be sure to dress comfortably and appropriately for the weather. Get tickets early before they sell out. July 14, Chateau Morrisette's Black Dog Country Music Festival welcomes electrifying multi-instrumentalist singer-songwriter Hudson Moore, modern-vintage Nashville legacy bearers Little Feather and Franklin County's own Crawford and Power. Both Little Feather and Hudson Moore have been recently recognized on Rolling Stone's lists of 10 New Country Artists You Need To Know. Crawford and Power have just released their debut EP recorded in Nashville. Come listen and dance to great country music all afternoon and enjoy your favorite Chateau Morrisette wines. Admission includes wine tastings through the afternoon, on site parking and entertainment. Beer, wine, food, and crafts are offered for sale. Discounted advanced ticket price of $20 ends 4p Friday, June 29. Tickets sold after this time will be gate price of $30. Gates open at 11a; tastings begin 11:30a, and music begin at noon. Seating, sunscreen, and a canopy or other sun protection recommended. Canopies welcome in designated areas behind the dance and seating area. Children under 12 admitted free with paid adult admission. No refunds - the music goes on rain or shine! No outside food or drink. Designated driver/non-drinking adult tickets discounted. The festival is held at the Nancy Morrisette Festival Field, 3641 Black Ridge Road, Floyd Virginia, just a half mile from the winery and restaurant. It's a good thing the Blue Ridge stays cool, because our Sunday Sounds stage is getting hot! Lew Woodall started our season with finesse, and we'll continue to host jazz every first Sunday. This weekend, June 10, we're excited to continue our tradition as a stop on Southwest Virginia's Crooked Road with Whitetop Mountain Band! This event is part of the Crooked Road's Mountains of Music Homecoming weeklong series with performances throughout the region. See the full Sunday Sounds lineup here, and we hope you can join us soon! Whitetop Mountain Band tunes up before their 2016 Mountain of Music Homecoming performance. As part of Chateau Morrisette's year long 40th anniversary celebration, the winery will make two of our most distinctive varietals available for a limited time at 40% off. Viognier and Merlot normally retail for $33.99 and $28.99 respectively. During the month of March, these wines will be available for $20.39 and $17.39 in our Tasting Room and in the Restaurant. Online, the wines are slightly higher at $20.99 and $17.99. Chateau Morrisette can now ship to 32 states all across the country. Aromas of fresh cherries, dark chocolate, and a hint of white pepper. 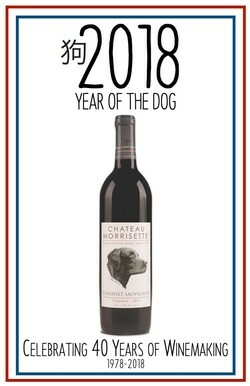 Soft and approachable on the palate, with a refreshing acidity, cherry notes, and a touch of dark chocolate. Pairs well with most tomato-based Italian dishes or even with simple hamburgers off the grill. For a sweeter experience, try with your favorite dark chocolate. This Merlot was grown in eastern Virginia and our cellar crew still remembers this specific lot of fruit because it was of such high quality. The fermentation took place in open top stainless steel fermenters with two to three pump overs daily. Post press and malolactic fermentation it went to barrel for 14 months for aging prior to bottling. The Viognier fruit used to make this wine was grown in Tyro, VA.
After pressing, this wine was first inoculated with a non-saccharomyces yeast strain to promote intense aromatics. Subsequently, it was inoculated with a standard saccharomyces strain to complete its cool, slow fermentation. ￼Our 2016 Viognier offers a perfumed nose of tropical fruit and apricot which is complimented by a softly tannic palate reminiscent of honeysuckle and passionfruit. All of these wonderful flavors linger on the palate.